So this year, right, we’re going to get our online shop going. Oh yes we are. Don’t pull a funny face like you don’t believe us. But until that time we thought we’d try and tempt you with a range of special offers which are available to our internet customers only. We’re starting with a spice bundle, chiefly, if you must know, because it will fit in the post box, which means that we don’t have to queue at Peckham Post Office, which is a really dire thing to have to do. And also because it is January, and spices are good for you and will chase off the Winter blues. And also because our spices are so super-fresh and ridiculously cheap that we know you will rush back to shop with us again. 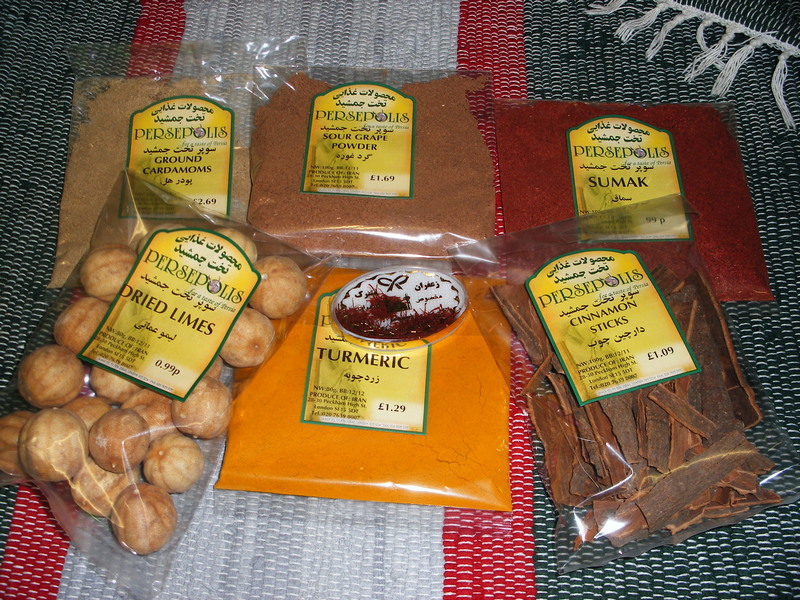 It comprises, as you can see, turmeric (good for detox, and essential in Persian food), dried limes (to add a cheery citrus burst to your food), sumak (‘cos it gets into everything these days), sour grape powder (full of anti-oxidants, and great for adding a sharp undertone to casseroles), ground Persian cardamom and cinnamon sticks (fragrant both of them, but they are also snuffle-busters and good for bad chests), and 1g of pure Mashhad saffron (normal cost £5.99; great for allergies, as it is, of course, pollen, and the ultimate posh spice). To tempt you even further, we’ll be posting a special feature on saffron elsewhere on the website in the next day or two. In a fit of generosity, Mr. Shopkeeper has agreed that we can absorb most of the cost of the (UK) postage ourselves for this, and so we have rounded the price for this down to just £15.00. OK, so our team of phone operators are standing by, waiting for your calls. Just dial 020 7639 8007, quote the special offer code (simorgh1*), and we’ll have that winging its way to you faster than you can say haji maji ya faraji (that’s Persian for hocus pocus). Most credit and debit cards accepted, although Amex are slow and expensive so we don’t really like to accept them any more.